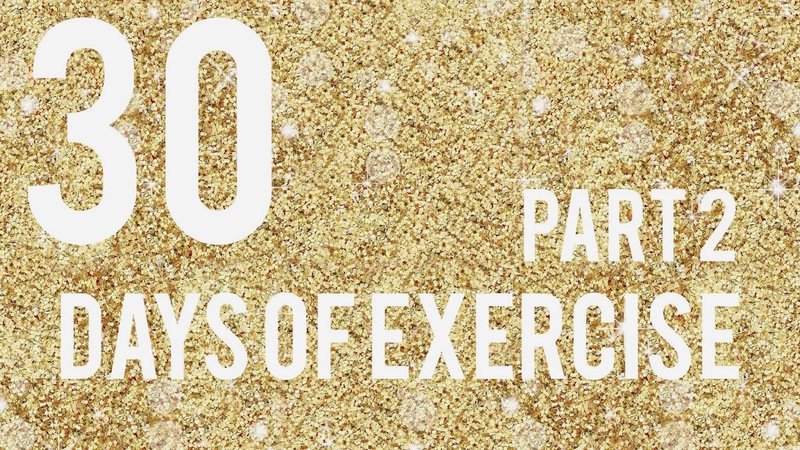 So, did you see Part 1 of my 30 days of Exercise? Sorry for the delay in this update it's been a busy few weeks ! I can't believe I actually went to the gym for a whole week in a row, but now THREE weeks. Crazy. Today was really hard, having felt like I had done a 'week' it kind of felt like starting over. I felt my shins hurting a little bit, but I battled through and just didn't push too hard. I always stop if I feel even a little unwell, you need to know your own limits and not push too much ! The gym was quite quiet today so I felt like I could pull funnier faces a bit more ! It kinda helped. Today we had guests coming over at the last minute and I didn't have time to go to the gym before so I just got showered and dressed. It meant having to go before dinner which was fine, but this was when I first noticed it being a bit of a pain ! But it felt good to still go and stick to my goal ! I had a really good work out and felt great afterwards ! Today was Sunday so I had a lazy morning then went late morning as we were going out for dinner. I pushed quite hard yesterday so took it a little more gently today. It made me feel great for the rest of the day though and this was the first time I didn't have pudding too, so that felt really good. I haven't really mentioned my diet actually, but I have been having a mixture of healthy & un healthy foods really, so I'll work on that later ! It's easy to fall in to the trap of thinking because you are exercising you can eat more rubbish. Today was Monday, so back to work. I struggled in the morning and decided to enjoy my lie in instead ! I thought to myself that I would just go at lunch time instead. However, I was so busy with work I ended up going after work, just as Si got in from work, so this made me think more about going in the mornings, otherwise I'd get less time seeing him ! I also felt quite lethargic having not had a shower (ew sorry) haha and then you feel a bit crappy when get back as have to get showered and then it's pretty much dinner and bed, so no point doing your make up and you feel kinda like you have wasted a day ! Today - wait for it...... I went to the gym BEFORE work !! I could't believe it !! I was so chuffed with myself, and you know what - people are much friendlier in the mornings ! People say hello on the walk there and the staff seem a bit nicer too, I don't know if that's just because I was happy with myself haha but the guy on the desk said that I always have a smile on my face !! So that was nice ! haha ! I felt SO much better today because I was showered before work, had my make up on and actually went out at lunchtime, mooched about the shops and then got a coffee from Costa too in the afternoon ! Yay for going before work ! It's only taken a week and half to get here ! I felt a millions times better going in the morning though! AGAIN today - BEFORE work. It was a struggle though, I think I snoozed too much and debated with myself and the duvet for a bit too long. I am so happy though, even thought I did't have much time. Today was a little bit harder as well to be honest, so I only did the treadmill and I didn't run it all either. But the important thing is I got my heart going a bit and was set up for the day ! I feel set for a really good run tomorrow ! That's the important thing - knowing when to push and when to slow down ! Day 14: Again I managed to go before work today, I think I'm getting in to the swing of this !! I ran for the whole 15 minutes today and felt great ! A really good start to the day, I sweated quite a bit which really made me feel like I worked hard ! Day 15: Today was a struggle. I had a bit of a sore tum so I took it easy. It's making me think about whether this is the right thing to do, not having a rest day - BUT it's really helping in terms of setting a habit, so I did what I could and made that do. Day 16: Today is Saturday and I felt a lot better so did a really good work out. Best yet probably and am looking forward to getting in to a routine so I can spend longer there really as I feel like I'm doing much shorter work outs normally as going every day. Day 17: Today we went to see family, so I had to go quickly before that, it will be nice to not have to go at weekends eventually. But it still felt really good to get my heart going, and I may have snuck in a pudding and not felt too bad about ! Day 18: Monday again and with work commitments it meant I ended up going in the evening, there really is a different feel for me going at this time, I feel lethargic and like I really cant be bothered. Didn't enjoy today. Day 19: I made sure I got up in plenty of time today and went in the morning again ! People weren't so friendly this morning, it was a bit gloomy so maybe that's why ! It rained a bit too, but felt good to still just throw on a rain coat and go !! I feel really determined to do this and feel it's just a part of what I do now ! Day 20: I felt tired today and didn't eat anything before, but did some weights and felt really good for the rest of the day ! It's strange, some days I really think my bodies changing, others not so much. Todays one of those days. I think I need to look at my diet ! Day 21: WOW, I had kind of lost of track of the days in terms of weeks and realised today is THREE WEEKS in a row ! I have never stuck to anything for that amount of time !! I feel really amazing and so proud and energised and excited about how exercise is just becoming part of what I do !! Thanks so much for reading....here's to week FOUR, oh my goodness !! I can't quite believe I have stuck to it for this long ! !